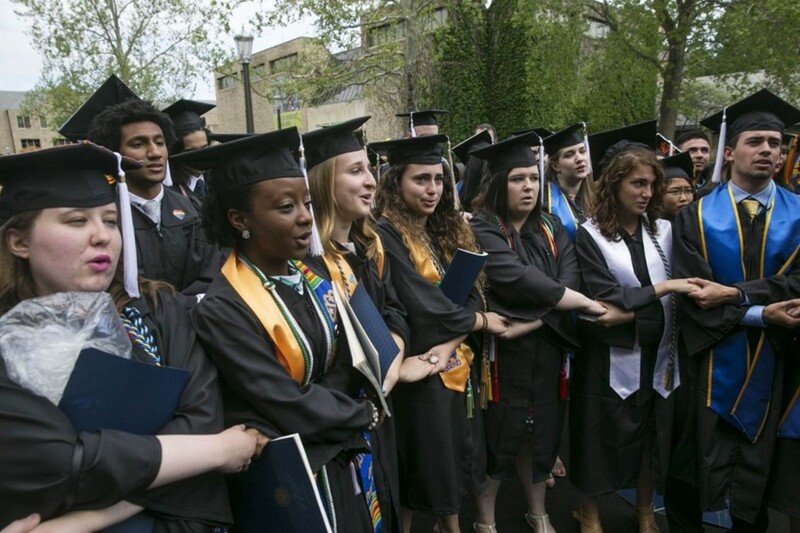 In a quiet but amazingly powerful protest, students graduating from the University of Notre Dame walked out of their ceremony, when the invited commencement speaker Mike Pence, began his speech. The prominently Catholic university traditionally invites the president to speak at the ceremonies, but thousands of students and faculty members signed a petition earlier in the year to stop this, citing the Trump administration’s crusade against the vulnerable. Tyksinski is one of the students, as part of the We StaND for coalition, who silently walked out on May 21. They began pushing their message out to the media in a “long planning process” over the course of several months. Tyksinski was also involved in producing a video that explains students' perspectives of why they would want to walk out – their experiences on campus, how they relate to policies endorsed by Pence and his rhetoric. “I think people don't realise how much goes into just one moment of walking out,” Tyksinski says. As videos of the ceremony show, it took the scores of graduands minutes to file out of the arena in a quiet but powerful act of protest. Many of the students involved in the protest stood against Pence for different reasons: his political career as a governor saw him support anti-choice legislation, assert that women should be forced to bury foetuses, and supported gay conversion therapy. His role in the Trump administration continues to hurt some of the most vulnerable. Tyksinski calls the reception that they’ve received since the graduation walkout “overwhelming”, but worth it. Since the weekend’s events, members of the group have been receiving personal Facebook messages and emails of support. Many, according to Tyksinski, have spoken about the big impact on how they felt about Christianity. Pence consistently uses his own religion as a basis and reasoning for some of his harsh and dangerous policies. Some of the students at Notre Dame, a Catholic university, wanted to put across that their values were not being upheld despite what the current administration says. Tyksinski says: “We just thought Pence and this administration overall don’t conform to how we see our university and our university’s values, which are often based in things like Catholic social teaching. This is really about taking care of the marginalised and looking out for the most vulnerable in our communities.